Four men from Somerset have been jailed for kidnapping and killing a 39-year-old man. 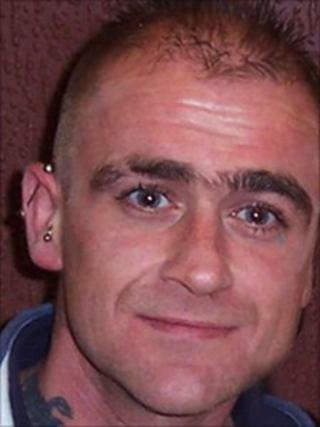 The body of Glyn Rowlands was found in a country lane at Ash, near Yeovil, on 4 December last year. In a trial at Bristol Crown Court, David Rose, 23, was found guilty of murder and Daryl Mahoney, 19, and Ben Pamplin, 23, guilty of manslaughter. Rose, Pamplin and Joshua Hann, 22, were convicted of kidnap while Mahoney had pleaded guilty to that charge. The court heard that Mr Rowlands had got into a dispute with Mahoney who believed he had stolen a large amount of gold from his family. Det Insp Ed Heath, of Avon and Somerset Police, said: "On the 3 December 2009, Glyn Rowlands was lured to his death using a calculated, well-organised plan. "The kidnap was a premeditated act by David Rose, Daryl Mahoney, Ben Pamplin and Joshua Hann, and came when Glyn was at a particularly vulnerable moment of his life. "Once abducted in Yeovil he underwent a sustained, brutal and degrading assault at a number of locations leading ultimately to his death in a quiet country lane in the village of Ash on the outskirts of the town." Rose, of Lyde Road, Yeovil, was jailed for life for murder and six years for kidnap, to run concurrently. Mahoney, of Chilthorne Domer, Yeovil, was sent to a young offenders' institution for nine years for manslaughter, and for four years, to run concurrently, for kidnap. Pamplin, of Holywell, East Coker, was jailed for 11 years for manslaughter and for six years, to run concurrently, for kidnap. Hann, of Flax Way, Yeovil, was sent to a young offenders' institution for four years for kidnap. Det Insp Heath said: "I would like to thank those witnesses from the Yeovil area who came forward to the police and assisted us from an early stage in the inquiry. "Without their co-operation and willingness to help, the convictions would have been extremely difficult to achieve. "This was thankfully an isolated incident."